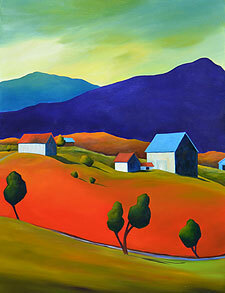 Anne Cady's distinctive oil paintings, featured this month at Vermont Artisan Designs, are inspired by the Vermont countryside that surrounds her. 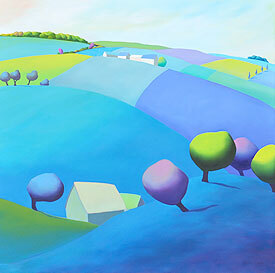 Her recent travels on the back roads of California and Southern France have begun to influence her newer work. Her paintings are playful and bold, full of vibrant color and spirit. They are held in collections throughout the U.S., Canada, New Zealand, and Europe. Her online artist statement reveals that "through my paintings I am able to journey back to that slower country rhythm of the past, away from this hurry-up world and into those open spaces that are so quickly disappearing. While on this ride, I can be playful with the harmonious patterns of fields, forests, and mountains that repeat themselves again and again within the landscape." "I was born in California and raised in Connecticut but have spent most of my adult life living in Vermont. My great, great, great grandparents helped settle Middlebury, Vermont, and my father, a Vermonter who worked in New York City as an editor of books, instilled a love of the mountains in all of his five children. I understood at an early age, while spending my summers on a horse farm in Middlebury, that Vermont was where I felt most at home. "After graduating from Middlebury College in 1973, where I studied printmaking with David Bumbeck, I devoted my career to the arts. While raising my four children, I established The Children's Art School, where I worked as a private art educator dedicated to providing substantive art experience to young people. "In 1990, my teaching career was honored by Middlebury College with a gallery exhibition entitled 'A Child's Vision.' This show of my students' work was part of the college's annual recognition of alumni in the arts. My father died the day the show closed. During the difficult winter that followed, I was invited to join a painting guild led by a gifted teacher and painter, Cynthia Price. It was then that I began to focus on my own personal vision. "In 1997, one year after the birth of my fourth child, I had my first solo gallery exhibition. After twenty-five years of teaching, I closed up The Children's Art School. Sales of my work over the past twenty-two years to over 700 private collectors throughout the world have made it clear that becoming a full-time painter at that point in time was the right choice. However, the approach I bring to my work remains in part a result of my many years of making art with children. Their gift to me was to show me over and over again the simple, colorful, and expressive way in which they interpreted the world around them. "My home is located on a small horse farm in New Haven, Vermont. If I am early enough, I can watch the sun rising over the Green Mountains, and in the evening have views of the sun setting in the Adirondacks."